Pour one 5 gr. sachet into the 5-7 lit. watering can to make cold water solution. Use wooden spatula to stir solution in water can well to ensure AminoA Plus is fully dissolved. 5-7 lit. of AminoA Plus water solution is sufficient for up to 20 m2 of garden area. Pour one 5 gr. sachet into the garden sprayer to make up to 5 lit. of cold water solution. Shake garden applicator well to ensure AminoA Plus powder is fully dissolved. 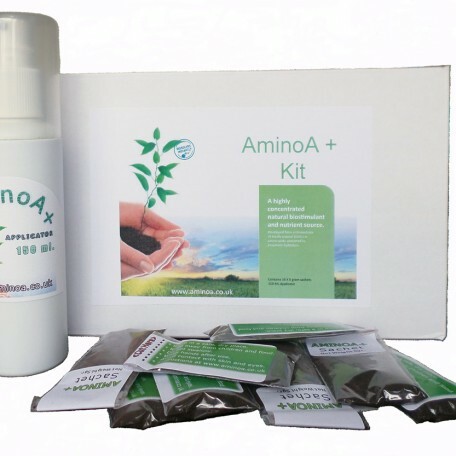 AminoA Plus can be mixed with all products except Copper (Cu) compounds, Sulphur (S) and oil. In olive groves it can be mixed with most Copper products, though it is recommendable to carry out a compatibility jar test first. Do not apply to plum trees without first testing each variety. The above information and recommendations have been obtained from extensive studies and tests. However, given that many factors beyond our control may have an effect during application, the Company only guarantees composition and formulation and will not accept liability for any damage or lack of efficacy arising from non-observance (total or partial) of the instructions given here. AminoA Plus is produced according to Regulation (EC) no 1069/2009 as Category 3 animal by-products and, therefore, is not fit for human consumption. AminoA Plus is registered and manufactured with official restricted approval from OF&G for use in organic agriculture.